A strong intimi-tank (chew toy) and a Charmer are highly recommended. A Buff Buddy and a backup healer are icing on the cake. 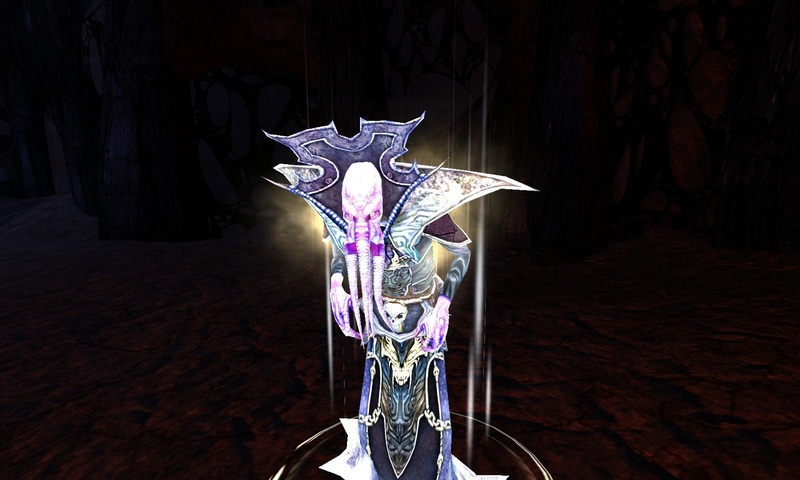 This raid does not require any flagging, and is accessed via Niara Tonant in the Marketplace Tent. The goal is to kill Xy'zzy, but she is invulnerable to all sources of damage except for bites from her puppies, until about 25% HP (at which point she becomes vulnerable to all attacks). The puppies can only be charmed via the Control Stones dropped by the mind flayers that spawn in each corner of the map. 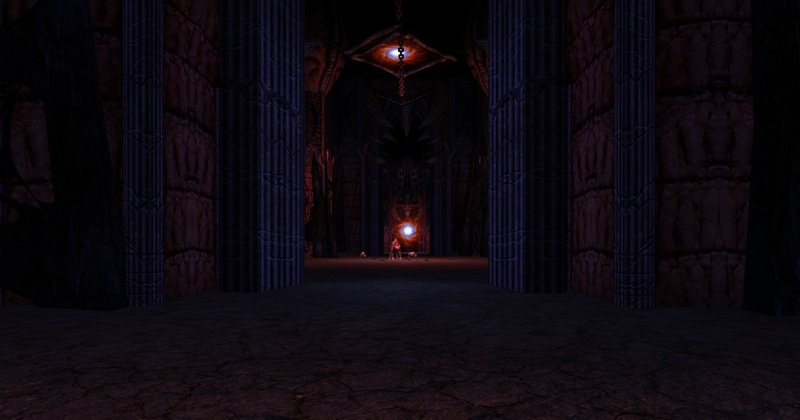 Throughout the raid, enemies constantly spawn, and the longer the raid goes, the stronger these enemies become. Chaos Orbs join the outer edge after about 3.5 minutes. Baby beholders start spawning after about 5 minutes, and large beholders start spawning after 10 minutes. You will want an intimidate score of 130+ to ensure you are always able to control Xy'zzy. High AC and PRR helps to negate her physical attacks, and a high reflex save (70+) will prevent her bee breath from sticking to you. Intimidate will also keep her puppies near by until they are ready to be charmed, and will keep them from attacking each other until they are all charmed. I suggest putting your back to a wall so that only you will be hit by her bee breath (it can wreak havoc amongst your non-tank party members). Constantly spam Intimidate to ensure Xy'zzy stays focused on you and never turns to kill one of her puppies as they beat her down. If someone gets afflicted with her bee breath, stepping into a globe of invulnerability will dispel them. The more specialized the Charmer is, the faster the raid will complete, as the main source of Damage against Xy'zzy is her charmed puppies. The following are all inherent buffs that you can strive for (it is possible to get all of these on one character by having 11 druid levels and 5+ warlock levels). Some of these can come from the charmer, though it may be more efficient to have another player be a buffer to cast many of these as well. It must be noted that Bardic Ballads do not apply to charmed creatures. However, Bardic Inspiration effects do apply. This applies numerous effects, including up to +9 to hit and +11 to damage on every attack. The Sharp Note add-on to Fascinate also applies. Xy'zzy is immune to most effects, but a few are able to be applied. Assign your Chew Toy and Charmer (and buffer). Everyone else will be tasked with killing the Mindflayers (so that the charmer can collect the Control Stones), and dealing with the respawning enemies (ensuring that none are able to harass the charmer and tank). 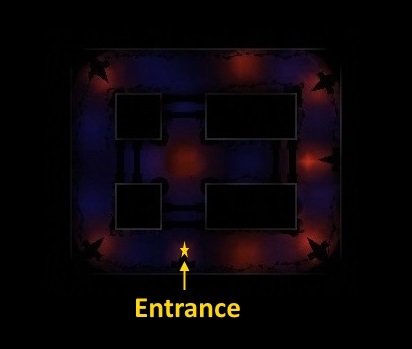 The whole raid takes place in single room (connected hallways) that form a large rectangle with a cross intersecting it. The entrance is along the southern hallway, at the base of the cross. Upon entering the raid, do NOT move until everyone is inside and buffed up and ready. The Chew Toy should be the first to move, heading straight into the middle where Xy'zzy and her 3 puppies are waiting. The Chew Toy will intimidate them all and will be holding them for the rest of the raid. From this point on, there are 2 methods for how to proceed next (with regards to killing the Mindflayers and gathering the Control Stones). The 'O' method (the most common one for PUGs to do, easy to understand, but not very efficient), and the 'H' method (requires a bit more character strength, but is more effecient). Everyone heads west and continues around the outside perimiter of the map in a clockwise direction, killing everything they come across as they go. They do one complete circuit then continue on to the south-west corner. 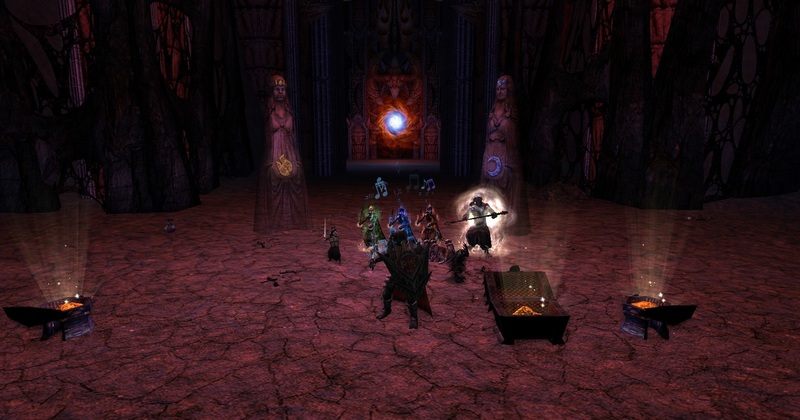 This will result of 4 Mindflayers dead, and thus 4 Control Stones collected. 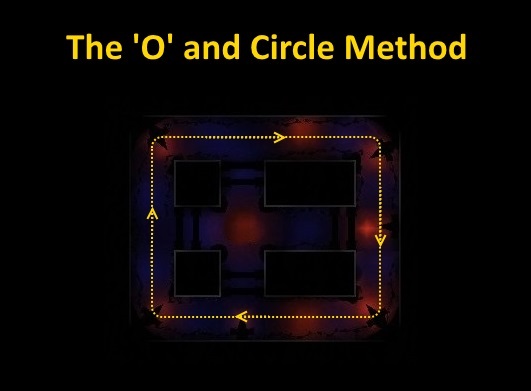 This method is faster and more efficient, but requires a stronger party as they will be splitting up. The Mind Flayers spawn in the North corners first, then in the south corners, so this method has the party split up into East and West teams. Each team heads to their assigned sides, head to the north corner, kill the mindflayers there, then head down to the south corners and kill the mindflayers there. 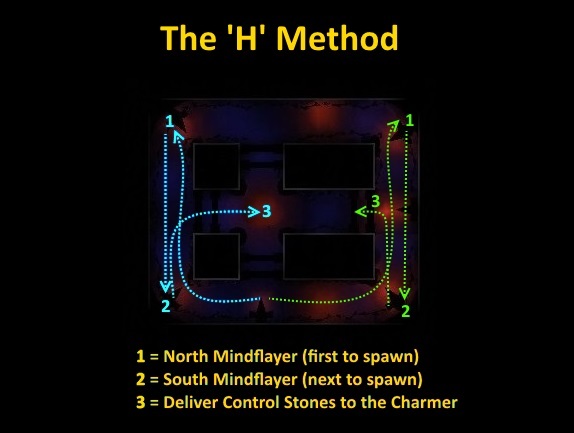 They then head back up to the middle of each side (with the west side coming in to the center) so that the charmer can be traded to 4 collected Control Stones (this is called the H method due to the top view of the movement resembling the letter H). The whole party (everyone who is not in the cross dealing with Xy'zzy and her pups. So all but the Chew Toy, the Charmer, and the buffer or tank healer if they exist) simply continues to run laps of the map, killing everything as they come across them (see the 'O' Method above). This is risky as if the group is not very strong, they will either stay as one moving ball of death (and thus if an enemy spawns after they pass, they will have free reign of the middle cross and be able to harass the charmer and tank), or they will get separated and die to the respawning enemies quickly, resulting in soul stones far away from help. This is best if preceded by the H method. This also works best if the Chew Toy brings Xy'zzy and her pups halfway into the east hallway leading out from the center. The East team positions themselves in the middle of the east edge of the map, at the end of the east hallway of the cross (that the tank is in), directly in front of the portal there. The West team moves into the exact middle of the cross where all paths intersect. The East Team should be stronger or have more party members than the West Team, as the East Team will be doing most of the fighting/killing. Most of the enemies that spawn will do a lap of the perimeter before coming in, so they will end up running into the East Team regardless. Also, the middle east portal spawns 3 orange named renders at a time (who like to run into the middle right away), so you want to be ready and in possition for every time they spawn. The West team will ONLY fight if an enemy starts coming into the middle. The West Team must NOT attack anything pre-emptively or try to lure enemies into the middle. They are only there for the few rare times something comes in without running into the East Team first. As such, the West Team can be made up of only 1-3 people, and if there is a buffer/healer, they can help them as needed. There is one final set of variations to consider, and that is how many puppies the Charmer charms. The most common method is to charm all 3 puppies at once. This was especially effective in Reaper difficulty as the enemy damage boost carries over to charmed enemies (and thus the puppies as well). However - in Epic Elite - even with a fully decked out Charmer with a Buffer buddy and a Rebuke Foe debuffing Xy'zzy, it is rare to be able to one round Xy'zzy and you end up having to wait for the mindflayers to respawn in order to recollect stones and be able to charm the puppies again. The other strategy is 2:2. That is, you charm 2 puppies and kill the 3rd one. This means that when the charm wears off, you already have 2 stones ready to charm them again right away. Simply kill the 3rd puppy again if/when it respawns. ...Once Xy'zzy gets down to about 25% HP left, she becomes vulnerable to all attacks. At this point, everyone should dog pile on her to finish her off ASAP. Anecdotal note: Last time I did an EE run with a nearly fully decked out charmer, a buff buddy and rebuke foe being applied to Xy'zzy, the party insisted on the O/Circle method and charming all 3 puppies at once. It took slightly over 12 minutes to complete as we had to wait for a second round of Mindflayers (and thus control stones) to spawn. This means the party had to deal with large beholders as well as the rest of the respawning trash, and a few times the charmer and buffer were at risk of dying due to enemies getting into the middle. 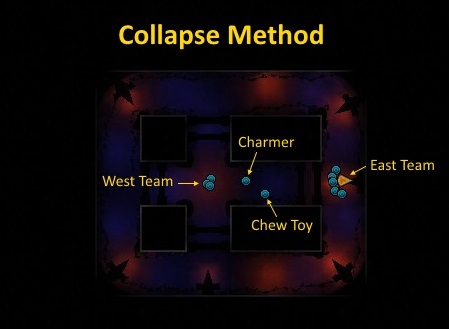 However, last time I did an EE run with the H/Collapse methods and charming 2:2 pups (but didn't have anyone with Rebuke Foe), it was very smooth, the middle group (charmer and chew toy) were never at any real risk, we didn't have to get new stones from the slowly respawning mindflayers, and it took only 10 minutes to complete (so someone may have seen a large beholder spawn only to despawn right away). Add in rebuke foe and it would complete even faster! Additional Notes: I did some testing a while back about other buffs to charmed creatures, and discovered that several things that many used to claim are must haves in fact do NOT apply. Consecrate with Crusade for example, does not show up in the charmed creatures examine window and I saw no noticeable difference when it was cast. Summer Smoke (additional fire damage) and Supple as Spring (bonus to dodge) also do not apply. Other warlock aura buffs for party members from Enlightened Spirit like Spiritual Defense, Spiritual Ward, Spiritual Bastion, Beacon, and Brilliance (+3 to ac, +3 to prr, +3 to mrr, +10 to healamp, and double your con bonus in temp hp) also do not apply. Aura of Courage does apply though, so further testing for Paladin aura buffs needs to be done. Wow, excellent guide. We could not have a better raid leader. Thanks for your hard work and dedication!